On a recent trip to Yelm, Washington I stopped by a local food co-op and plant nursery. A classic activity of mine, of course I picked up a few new exotic plants to add to my apartment’s ecosystem. 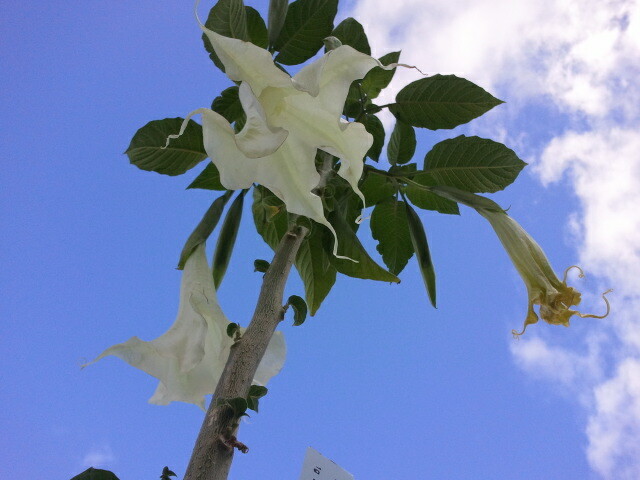 One of my favorite new ones is Brugmansia, or Angel Trumpet. The flower caught my eye from the moment I saw it, with its large sweeping flowers that looked like trumpets. The plant is affectionately called Angel Trumpet sometimes, and the flowers come in a variety of colors like yellow, orange, pink and red. The plant may have been beautiful at first, but in Yelm we were staying in a hotel room and after leaving it there for several hours, we returned to the most beguiling perfume-like scent. Caught off guard, I thought someone must have been in our room without us knowing it, but we discovered the Brugmansia had opened a new white flower, which exploded with the most incredible smell that was filling the room. It felt like the beach, a vacation, a dream. After enjoying this plant for a few weeks, I did some research on its care and uses. I was quite surprised to learn this plant has quite the history, and has actually been banned in a few places because of its high toxicity to humans and pets. The leaves, stems and flowers are all wildly poisonous, and many people over the years have tried to consume it for its hallucinogenic effects. This would be a massive mistake-each plant has a different toxic makeup and it’s impossible to tell how much of each plant would be poisonous to a person. Fully versed on the toxicity, I moved the plant to a higher location to keep it away from my dog. I don’t tend to make a habit of eating or tasting my exotic plants, so the beauty is worth it. The plant grows quickly, almost an inch per week, and I foresee tons of beautiful blossoms in its future. The flowers of this plant look similar to Datura or Jimsonweed, which grows natively here in Texas and is also poisonous. And it’s so beautiful and enchanting! 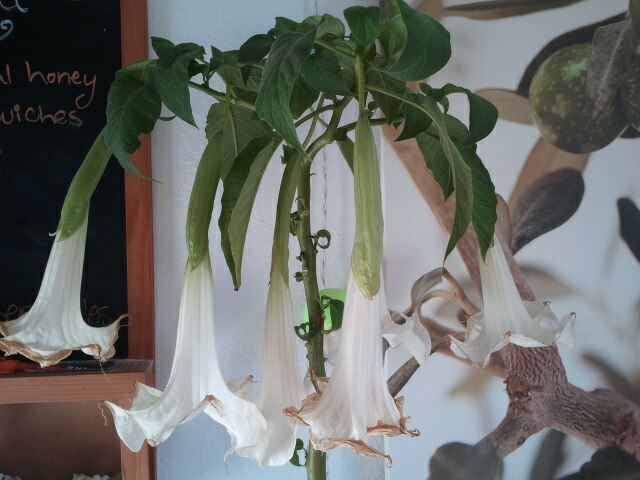 I love how you described the fragrance of the angel trumpet as being a vacation, a dream! 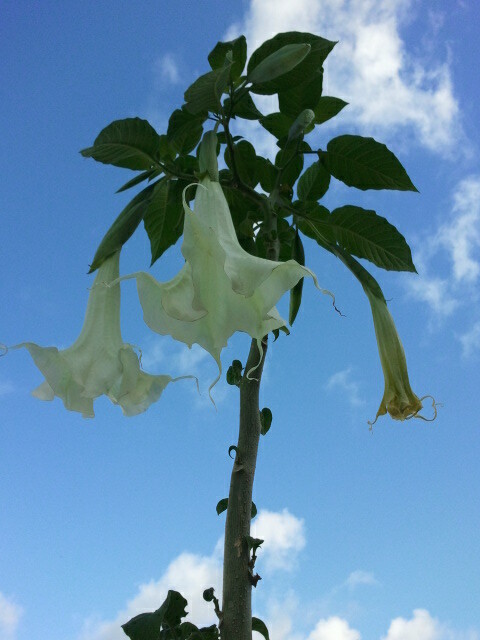 My son was totally enchanted by the Datura flowers growing on a big bush outside of his school. We stopped every morning to admire them. Once I found out about their toxicity, I warned my son that he shouldn’t put the flowers in his mouth, but it’s still okay to admire them. He replied, “there’s no reason why I would put those flowers in my mouth”. 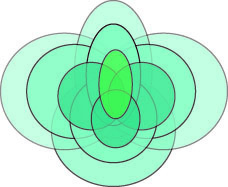 I think the flowers tell us not to eat them, and their medicine is in how they make us feel by being around them. Wow, that’s awesome! I agree-I think plants speak to us in many ways. I certainly have no desire to eat the flowers of this one, the scent itself seems to tip you off that it isn’t safe. I love when we can tell things like this! So beautiful! It looks like it will grow fairly large. My 11 year old son is interested in unusual plants as well. He purchased a Resurrection Plant a couple weeks ago. I looked up the Resurrection plant and how cool!! I want to get one myself and see how it grows-what an unusual species!